This form of checkers is still played in Holland, and originally derives from the province Friesland. In Frisian draughts the objective is to capture all your opponent’s pieces (draughts and wolves). Draughts move diagonally forward to an adjacent empty square. Capture is performed by jumping over an enemy piece to a vacant square on the other side. Capturing is mandatory and you must keep jumping and capturing as long as it is possible. Draughts capture in all directions, also orthogonally, on squares of the same colour. They promote to wolves on the back row (the Frisian name for the King is "wolf"). Wolves may move forwards or backwards on the diagonals. They capture in all directions (also orthogonally, on squares of the same colour) and land anywhere behind the captured piece. The wolf may only slide three times in a row. Then he must be set free by capture, or by the move of any other of the same player’s pieces. This rule is not valid if the player has only wolves left. In endgames with two wolves against one, the stronger party must win in seven moves, otherwise it’s declared a draw (since he should be able to win faster). Stalemate is a loss. It is mandatory to select the longest capturing line. If even, one must give precedence to the capture of a wolf. Otherwise, the wolf’s capturing move has precedence. Note that the real Frisian rules are more complicated, so this is a simplification. If a wolf can capture two wolves and a draught can capture three draughts, then preference is given to the latter. However, Frisian rules says that two wolves shall be counted as 4 - ½ = 3½. 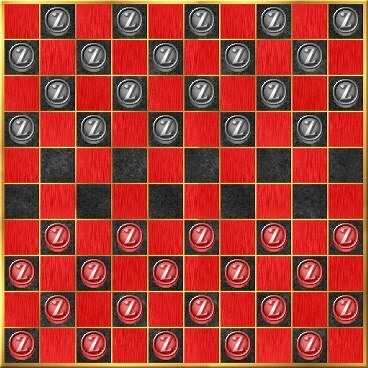 This is more than 3 draughts, which means that preference should be given to the wolf’s move. However, this does not occur often. Frisian Draughts is similar to International Draughts. The main difference is that both men and wolves (kings) may capture orthogonally as well as diagonally. Preference must always be given to the longest capturing line. If still equal, the wolf’s capturing move is privileged. 1. Can draughts capture backward? Yes. 2. Does a draught continue jumping after reaching last rank? Yes. 2a. …and can he be crowned and continue jumping? No. 3. Can wolves move any number of squares? Yes. 4. Are captured pieces left on the board until after the move? Yes. 5. Must you choose the move capturing the most pieces? Yes. 5a …and if even, give precedence to a wolf’s capturing move before the capturing move of a draught? Yes. 6. Must you give precedence to the capture of a wolf to the capture of a draught? Yes. 7. Must you give precedence to the capture of two draughts to the capture of one wolf? Yes. The game was mentioned first time in a book by Swaanenburg, printed in Amsterdam 1725. Around 1750 Lars (Lorentz) Mollberg (1734-1772) visited his relatives in Amsterdam (cf. Michaelsen, 1998). Apparantly he brought the game back to Stockholm where he played it in the sixties. Carl Michael Bellman (1740-95; famous Swedish writer and lyric poet) mentions it in a poem from 1783, about the ‘marquern’-playing corporal Mollberg. The game seems to have survived for a time in Stockholm, as G.J. Billberg mentions the game in his game book from 1838-39. By way of combinations one must try to attain material advantage, by exchanging one piece for two, or two for three, etc. In the endgame, material advantage generally leads to a win. But two wolves against one wolf is regarded as a draw after seven moves. A rule of thumb is that the wolf’s value is equal to 2 draughts. If both parties have a wolf, subsequent wolves are of less value. A good strategy is to try and get the first wolf, because this piece will cause a lot of damage to the opponent, provided he cannot capture the wolf quickly. You should try to hinder the opponent from getting a wolf, by keeping your lines closed so that he cannot break through. Remember that pieces can capture backwards, so you do not necessarily need to keep a thick layer of draughts in the last rows. Pieces that are too far advanced become fragile. You should try to keep your side organised in effective blocks, instead of spreading them out in many isolated pieces. In my program, the Frisian rules are enforced, with some exceptions (see above). The seven moves rule in endgames with two wolves against one is not enforced. (The player can himself check the moves list.) Nor is it necessary to enforce the rule that wolf vs. wolf is a draw. Billberg, G.J. (1838-1839). Hand-bibliothek för sällskapsnöjen, eller systematiskt ordnande spel, lekar och konster. Stockholm. Michaelsen, P. (1998). ‘Somme trak også tavl’. Ord og Sag 18, 1998.